Super little DP booklet for the Russian ship. 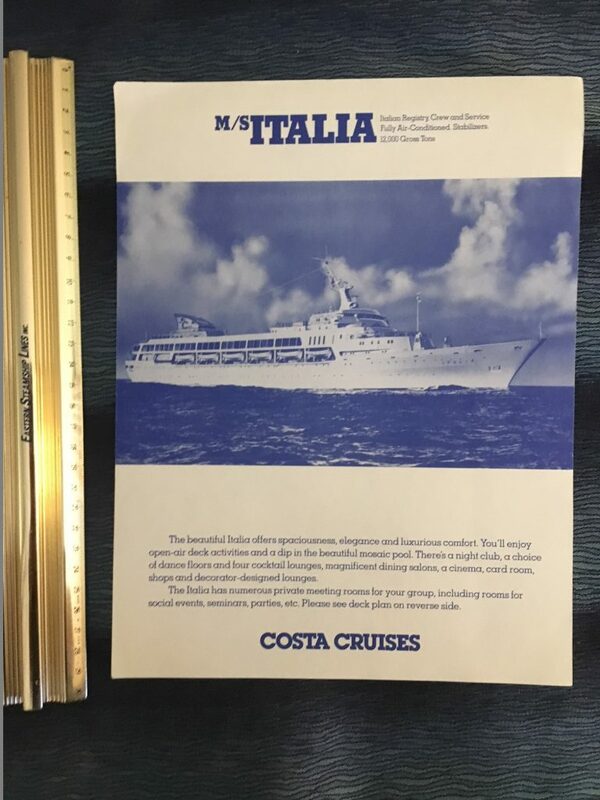 Includes lovely interior onboard photos on each page. She survives today as a popular dive site. Great 26 page brochure for the new Millennium. 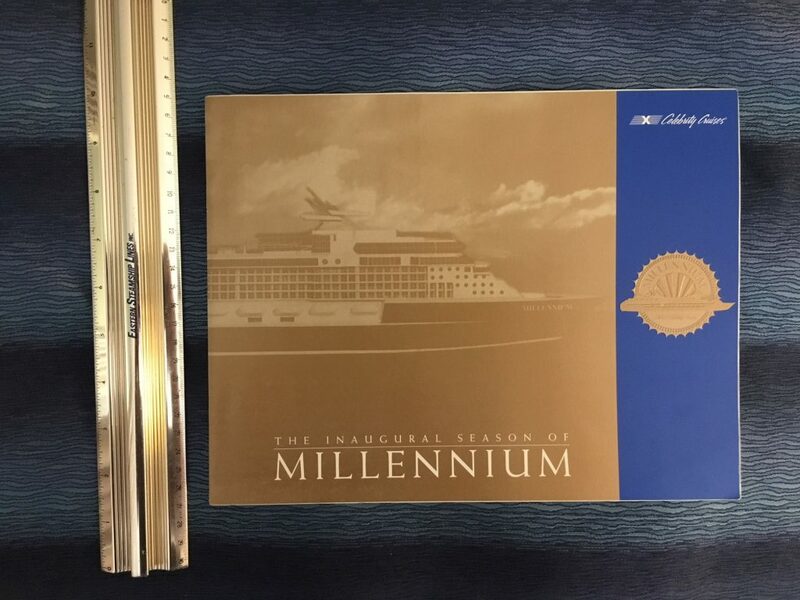 Outstanding gold and blue cover with embossed ship profile. Includes Lovely interior renderings of public spaces. There is an outstanding 3d cutaway and a couple of different fold outs. Excellent condition. 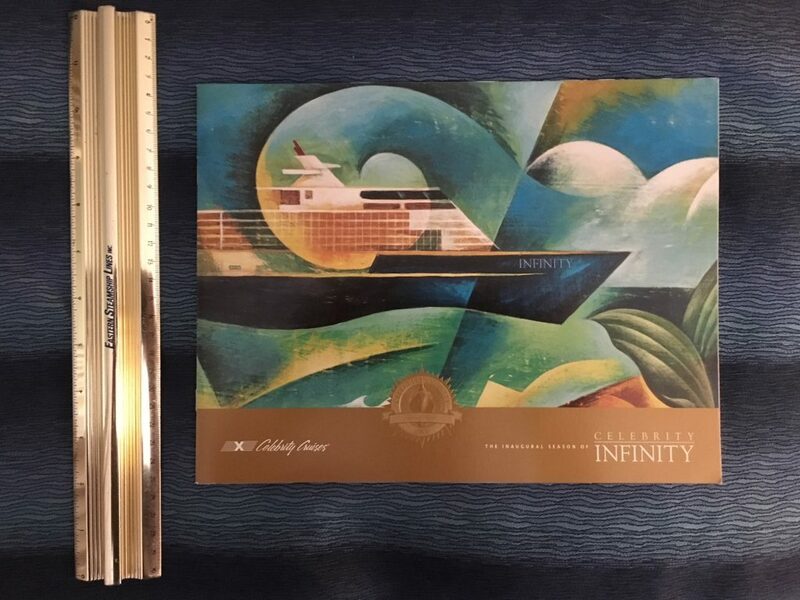 Great 28 page brochure for the new Infinity. Lovely interior renderings of public spaces are shown oppisite BW “life aboard” photography. There is an outstanding 3d cutaway and a couple f different fold outs. Excellent condition. 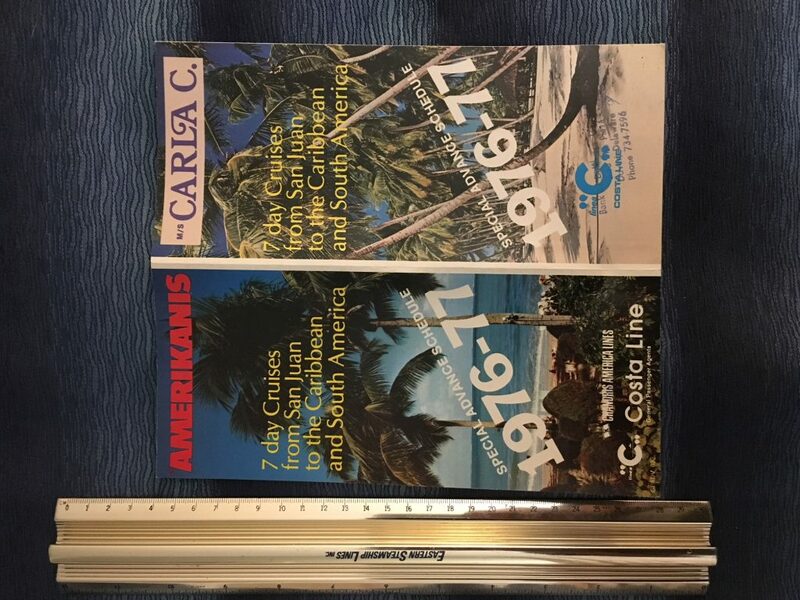 Costa Line: Carla C and Amerikanis 1976-77 Flyer. 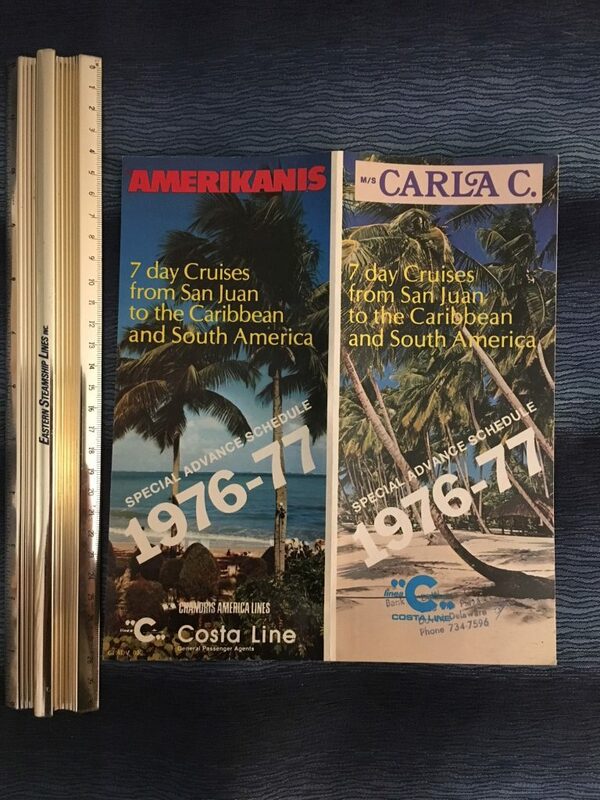 Great little flyer for each ships 76/77 7 day cruises season. Like New condition with a Delaware agency stamp. 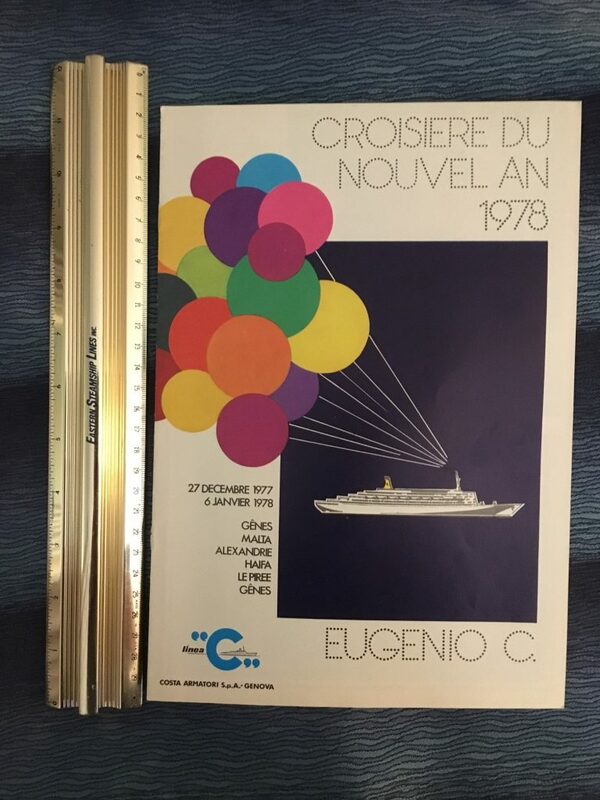 Super colorful 12 page brochure in French for the 1978 New Year’s Cruise from Genoa-Malta-Alexandria-Haifa-Piraeus- Genoa. Super cool and new condition. 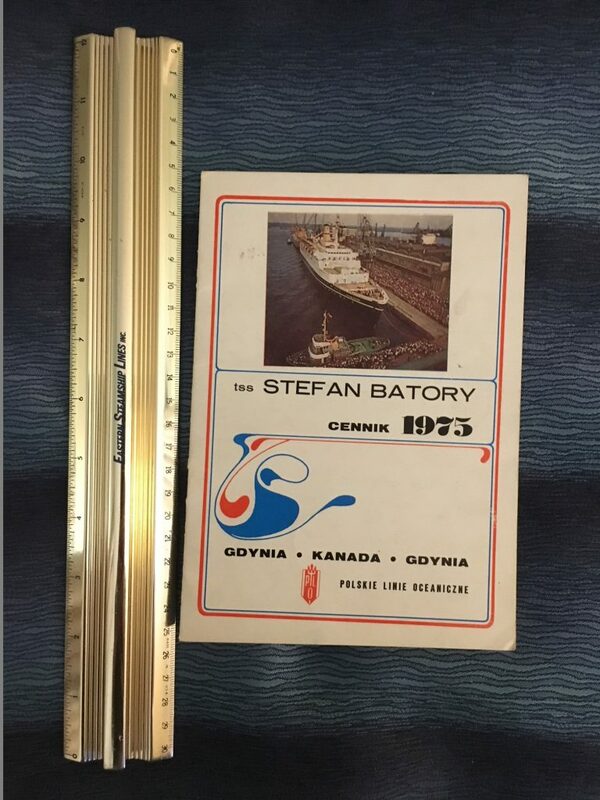 Great little booklet written in Polish covering rates, scheduled and general ship and line info. 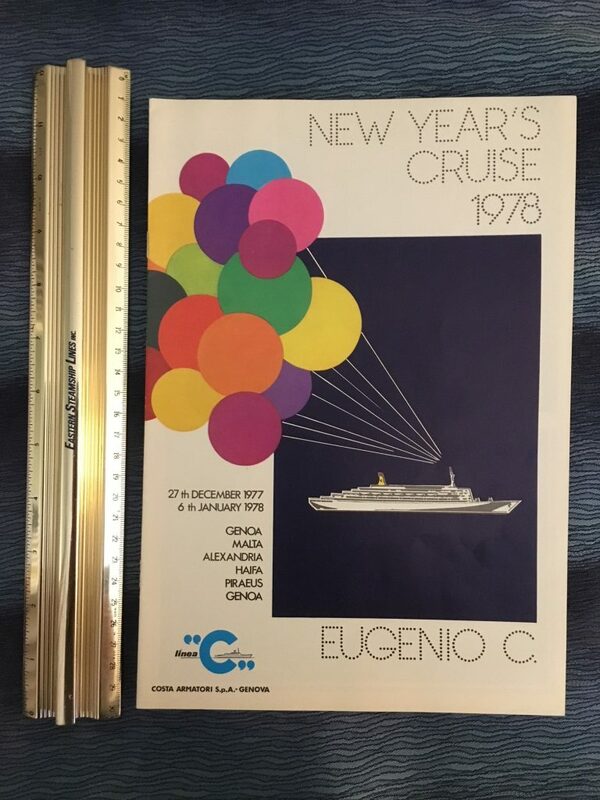 Super colorful 12 page brochure in English for the 1978 New Year’s Cruise from Genoa-Malta-Alexandria-Haifa-Piraeus- Genoa. Super cool and new condition. 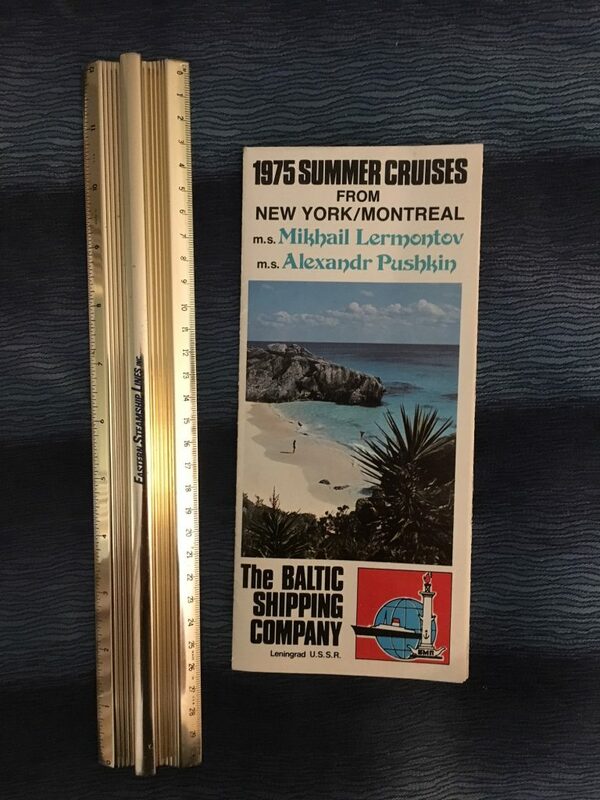 Baltic Shipping Company: MS Mikhail Lermontov and Alexandr Pushkin Summer Cruises 1975 fold out brochure. Lovely fold out for the 2 ships. 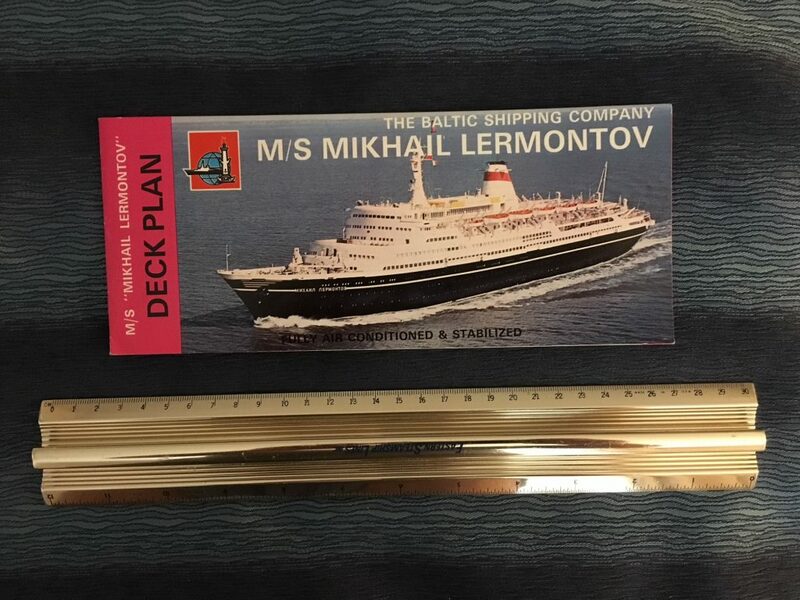 The Mikhail Lermontov was sailing out of NYC and the Alexandr Pushkin operated out of Montreal. 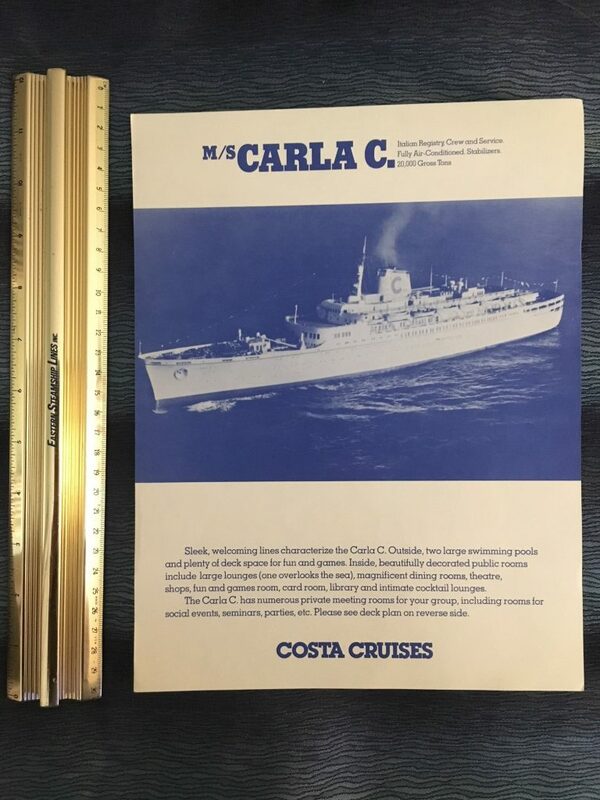 Great ships, lots of color photos in great shape with a Dover Delaware agency stamp. 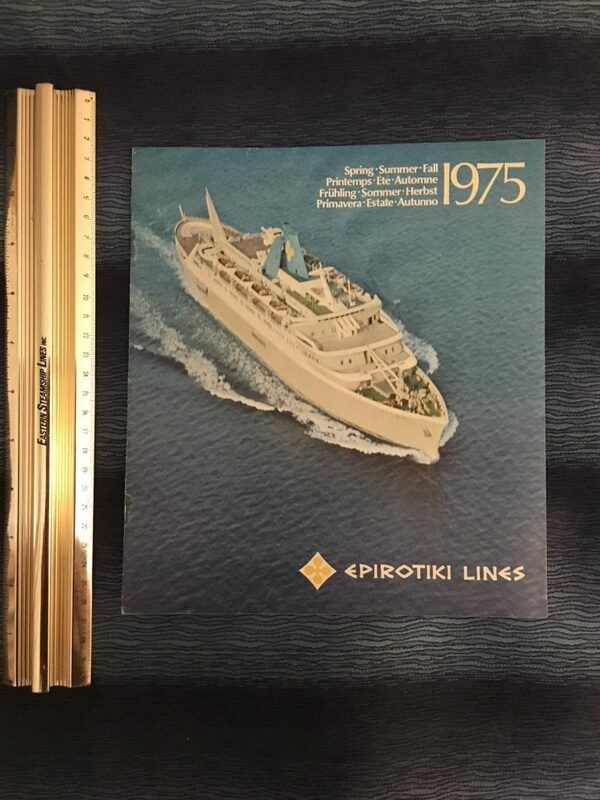 Great condition foldout deck plan Brochure for the ship dates 1975. Super great like new condition. This includes some nice interior color photos and a Delaware Agency stamp. 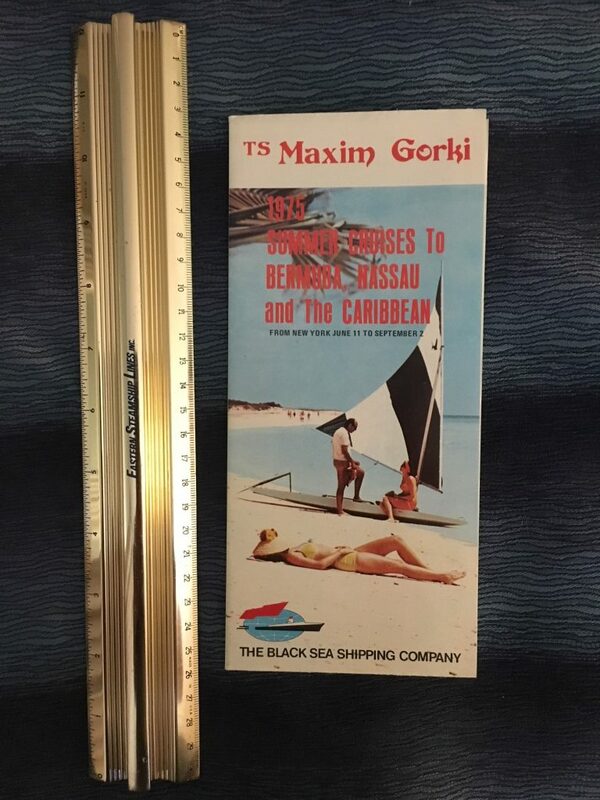 Baltic Shipping Company/Wall Street Cruises: MS Maxim Gorki Brochure Deck Plan. 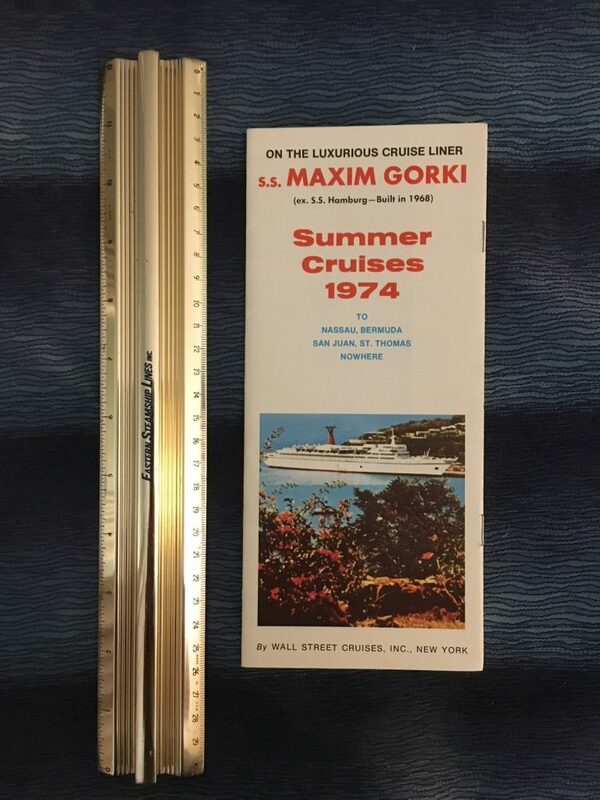 Great little DP flyer for the 1974 Summer cruises a la Maxim Gorki (Ex Hamburg). In great shape she was cruising out of NYC for Nassau, Bermuda and “No where”. Great onboard pictures and color DP. Great little cut sheet DP for the lovely little Italia. 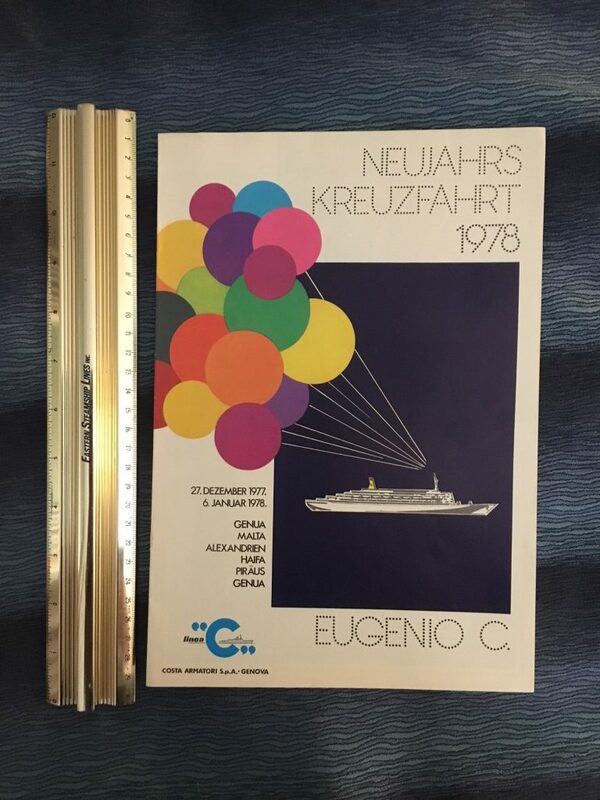 This was probably meant to be inserted into an Information folder for the ship. 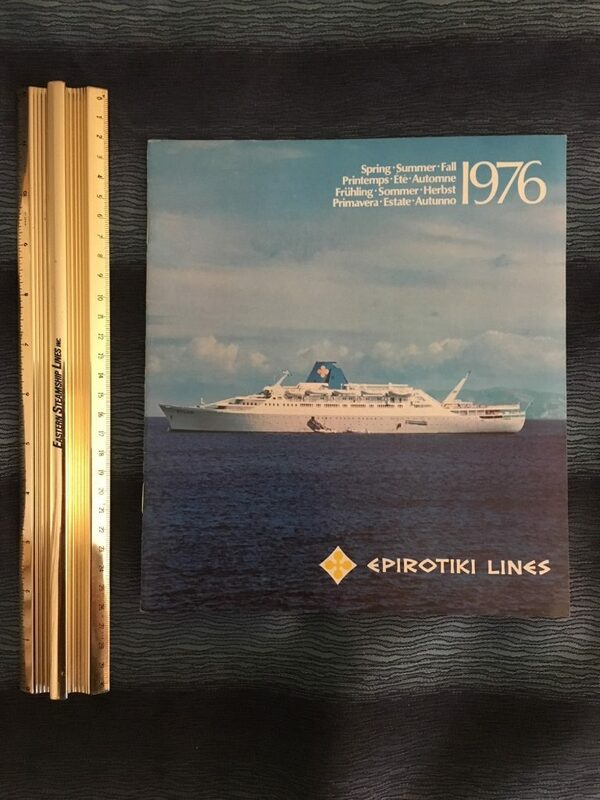 Lovely booklet covering the cruises over the 1976 season. Covers The Jason, Atlas, Jupiter, Apollo, Neptune, and Argonaut. 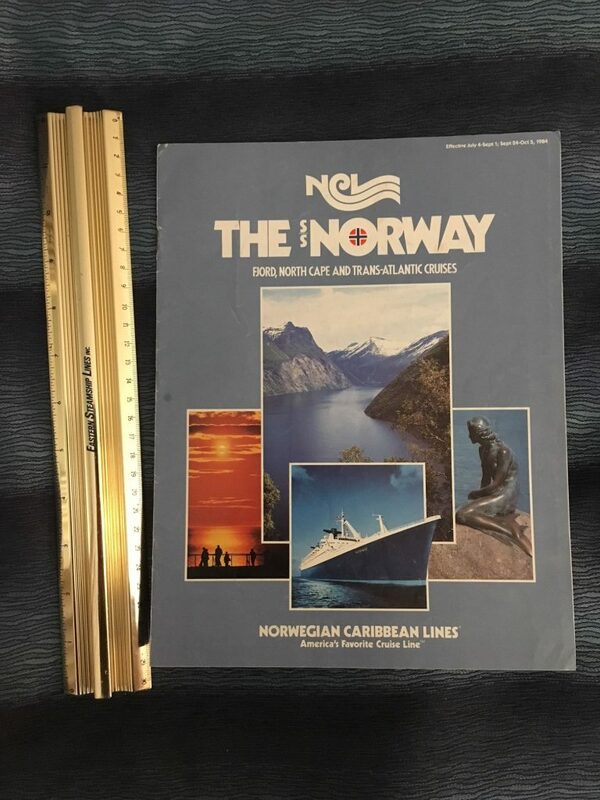 Includes mini deck plans and biographies for each vessel. Like new condition. 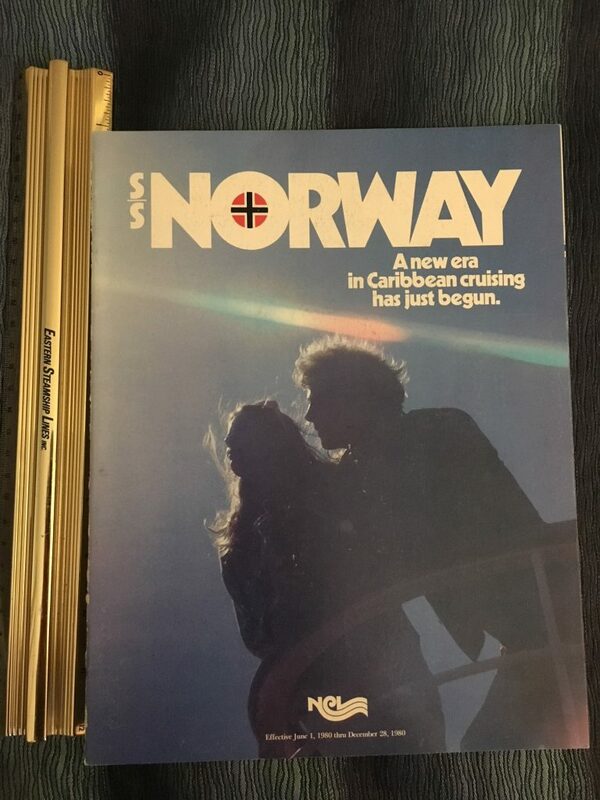 NCL: SS Norway “A New Era” Brochure June 1, 1980. 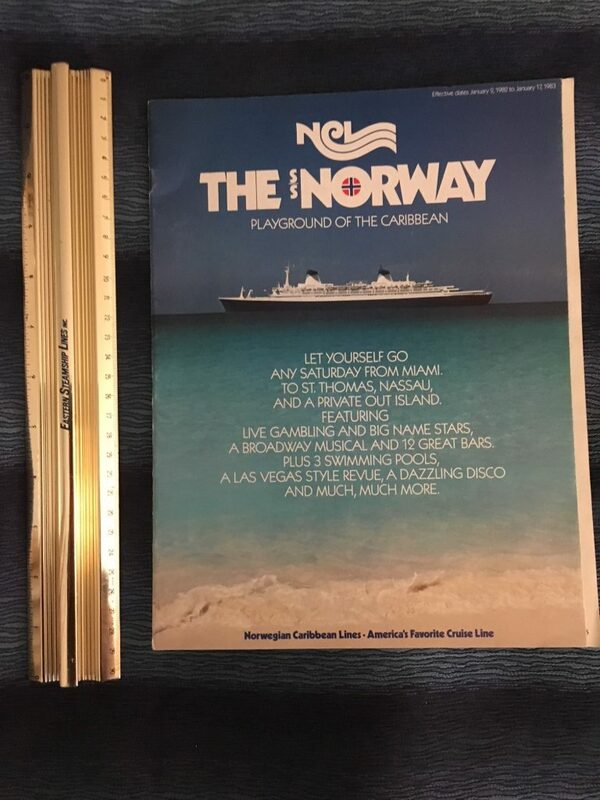 Early brochure for the lovely SS Norway .. published for her inaugural season. 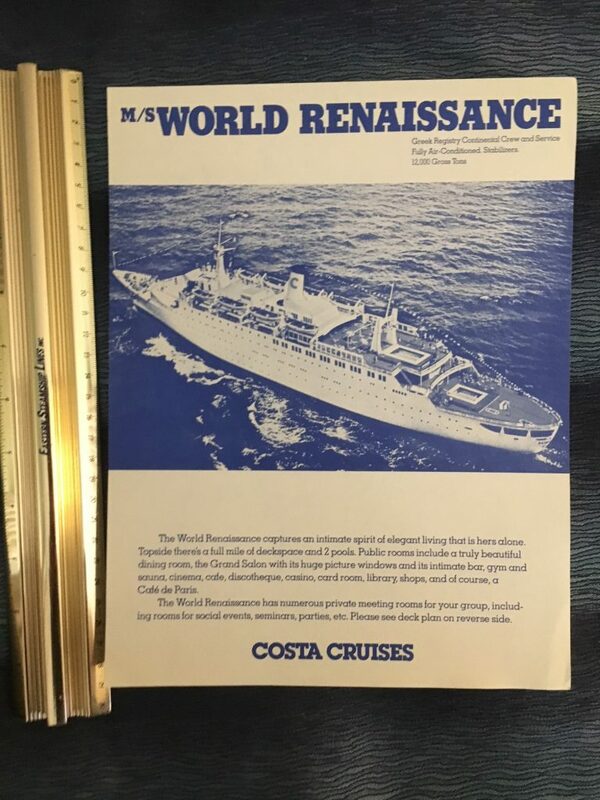 Fresh from her conversion from the France … she was the coolest thing ship in the Caribbean for the next decade plus. 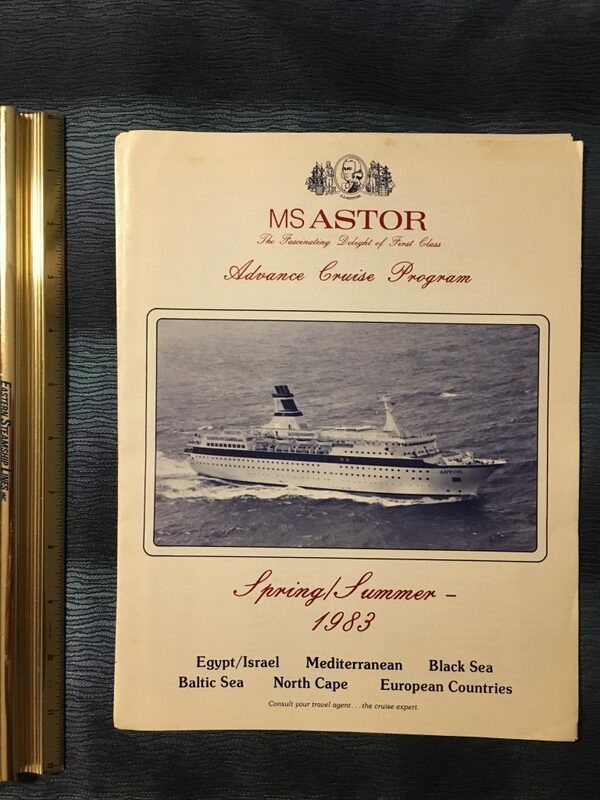 Excellent Spring/ Summer Advance Cruise program for the 1983 season . 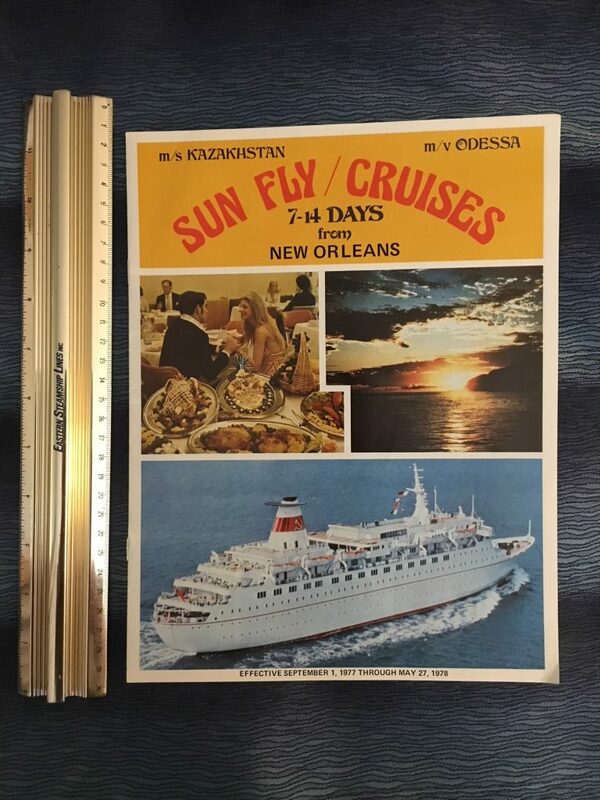 Cruise Voyages numbers 39-51 are described inside this lovely fold out printed on texture stock. Great condition! 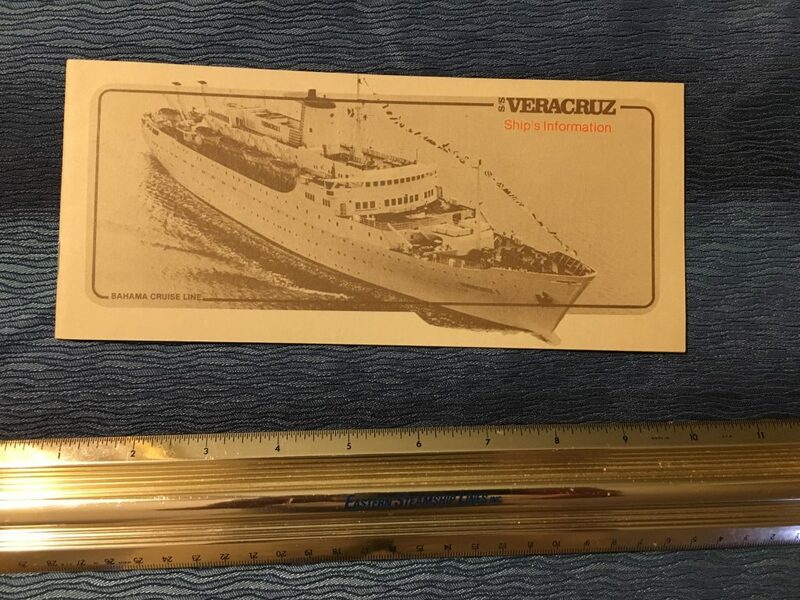 Ships Information Booklet for the lovely little Vera Cruz. 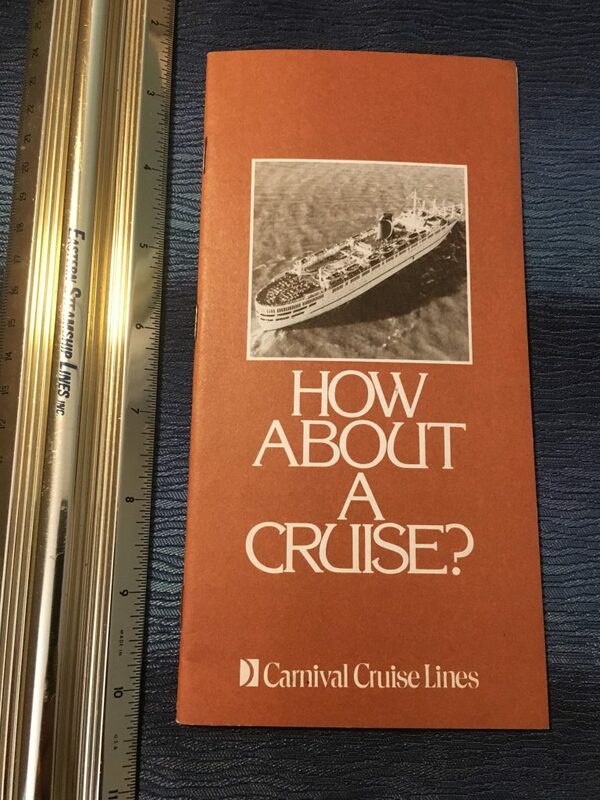 This is dated 11/80 and contains great On board Info. 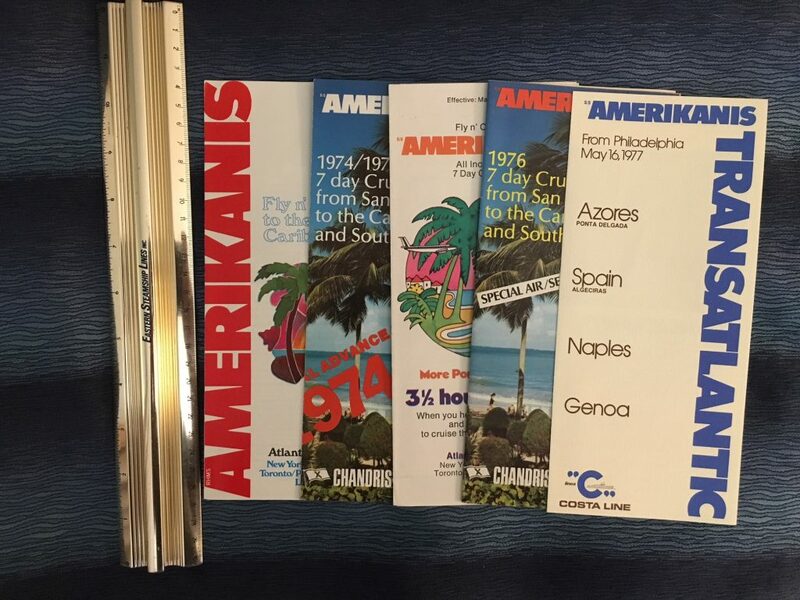 Super graphics and in excellent condition.